This past month I collaborated with Benjamin Thomas on a submission for 10k Apart. I’m pleased with how it turned out and am happy to present to you Kiku. Kiku is basically an online adaptation of Hanabi under a different name and theme. In the original game you’re trying to cooperate with your partner to figuratively launch different-colored fireworks. 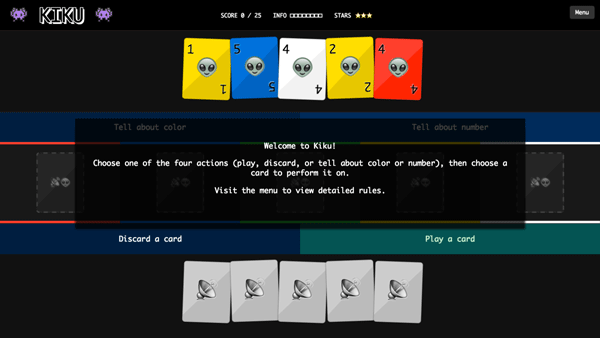 In Kiku you’re figuratively trying to establish contact with aliens on the other side of the galaxy. When Ben and I met to discuss what we could collaborate on we had two ideas: a website that explains an something in a fun presentation or a game. He introduced me to Hanabi and said he’d wanted to try to create a web-version anyway. I suggested — vaguely — we could do an interactive presentation surrounding the SETI signal that had just been discovered that week. We decided to combine the two. The contest is near and dear to my heart in many ways. In my work I often inherit existing projects and groan a little when I look at the size of the page loads. I’ve even been poked fun at for having a possibly unhealthy obsession with reducing latency, page requests, size and load time… But I think people forget these things really matter a lot when people talk about design and user experience — a lot more than some flashy video header that produces oohs and aahs but provide little in the way of information. I honestly feel like the web could be 90% text some days… but I’m digressing and hijacking this blog post to be about something else now. I suggest reading this: The Web Obesity Crisis. If you’re already familiar with Hanabi you should be able to more or less figure out how to play Kiku pretty quickly, I hope. If not, I suggest reading up on the rules and then heading over to give it a shot. The aliens are very aggressive about discarding cards it knows it does not need from a probabilistic standpoint. That aliens will generally discard the left-most card in their hand when forced to discard a completely unknown card.